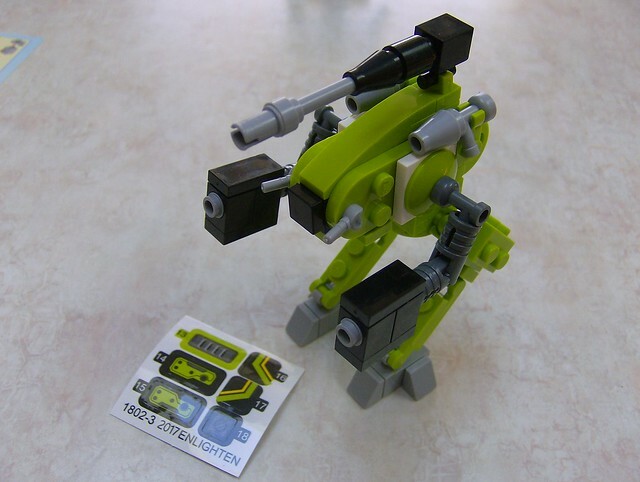 Continuing our streak of good finds, I was made aware of a set of four mini mechs available on AliExpress. What was notable about these was that they used some very prominent Mobile Frame Zero building styles, of which I will try to point out. It looks like we've been recognized by the off-brand bootleg market, so let's dive in. Welcome to BootLego. 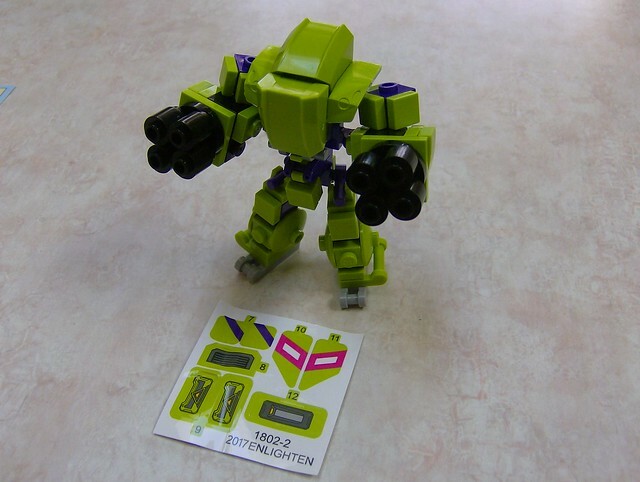 Coming as a lot of 4 mechs, we are revisiting a company I haven't bought from since the early days of BootLego; Enlighten. 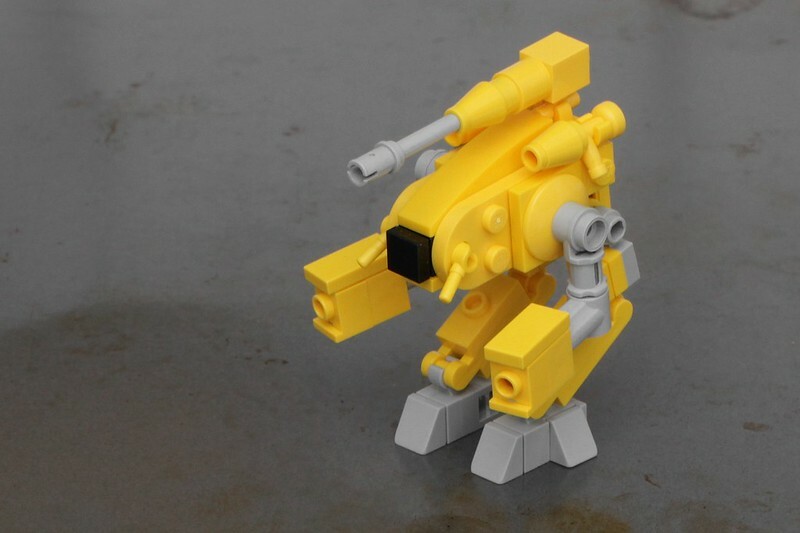 They mostly focus on space ships and mini military vehicles, but the sets we'll be looking at today are undeniably Mobile Frames, under the theme of "MECHA LEAGUE: Super Mecha Warrior! Our first Mecha League frame up for inspection is Anti-Tank Soldier, and this one is definitely my least favorite. 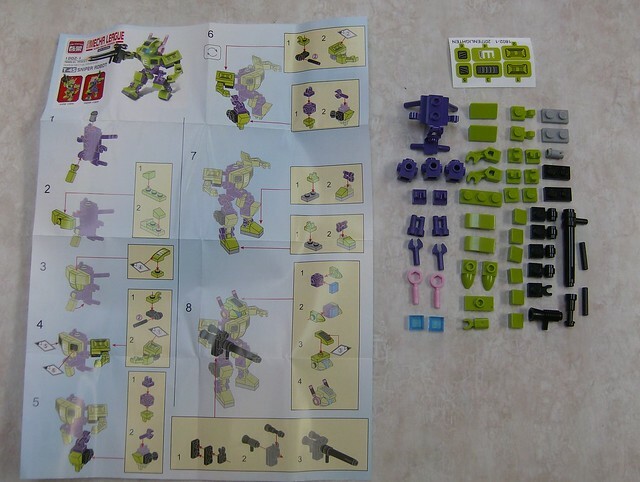 However the parts count is a respectable 67 pieces, all in a nice purple and lime color scheme. The first thing that stands out, and is the one common part of each member of Mecha League is this piece right here. I have never seen this piece in any Lego set (not saying it doesn't exist though), but wow! Clips and pegs galore make this a very versatile piece! Eh...what can I say, I'm just not personally a fan of 2-wheel mobile frame designs. Luckily there's plenty of pieces to experiment with, and it functions fine as-is. Of note, you kinda have to mix-and-match studs on the bottom to hold that ski piece on. It seems Enlighten's stud quality hasn't really improved all that much. 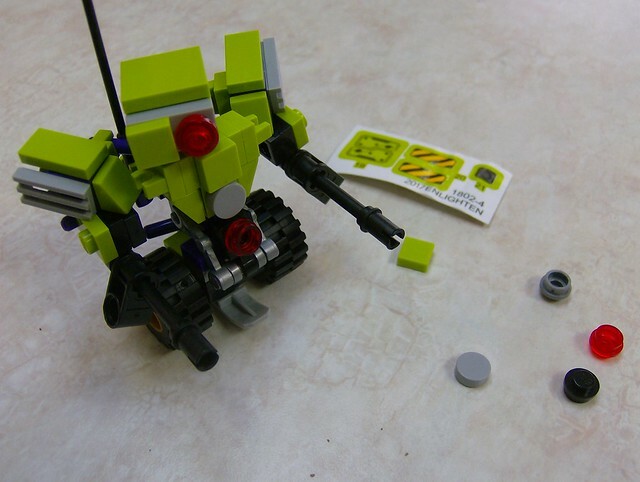 Up next is Sniper Robot who uses the same core piece in a slightly different way, and uses some interesting build techniques, especially on the ankles. This set has a much smaller piece count at 54 pieces. Sniper Robot also comes with a pretty great base for a gun (for those of us who have zero skill in building guns). The look on this guy is really great, however, I would say that this is the most flawed of the Mecha League line. 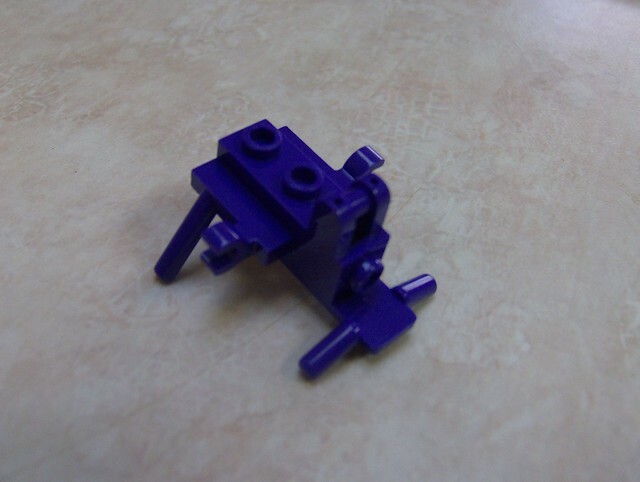 The clips holding the legs onto the core piece are just a tad too loose, causing the legs to flop, and the overall build of the figure limits the posability, specifically in the arms. 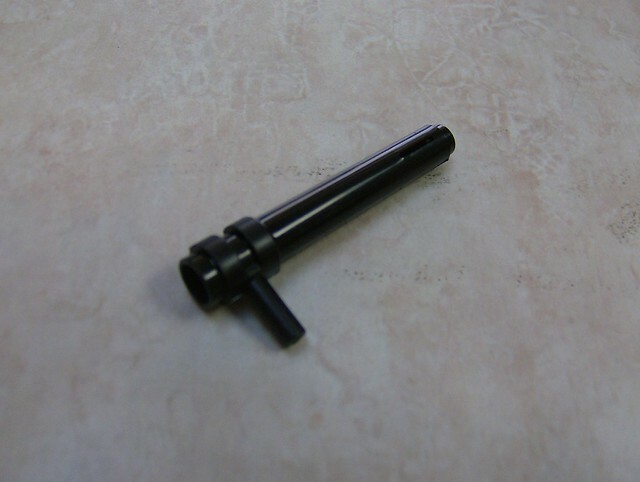 Also, the technic pin used to put the head on is incredibly loose, causing the head to flop around as you move it, and can actually slide out of the pin hole under the right circumstances. Kudos on using binoculars for those ankles, though! Armored Trooper is the third Mecha League member, and there's quite a bit to say about this guy. 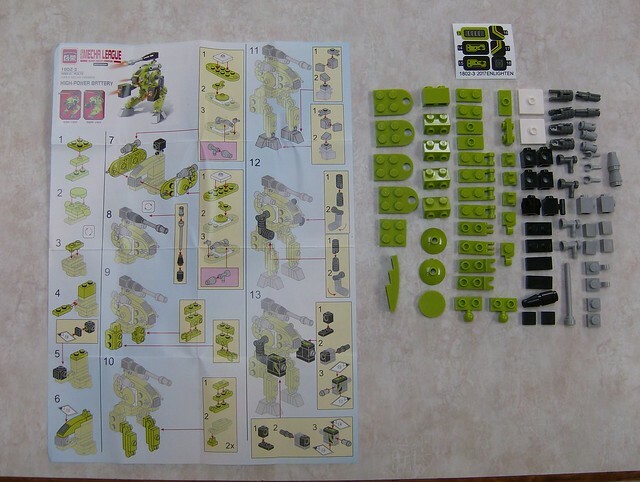 But, to start things off, lets look at the 68 pieces that make up Armored Trooper. Finally, we have our last member of the Mecha League, the Battletech Marau--I mean...High-Power Battery, coming in at a hefty 80 pieces. Okay, let's not kid ourselves. 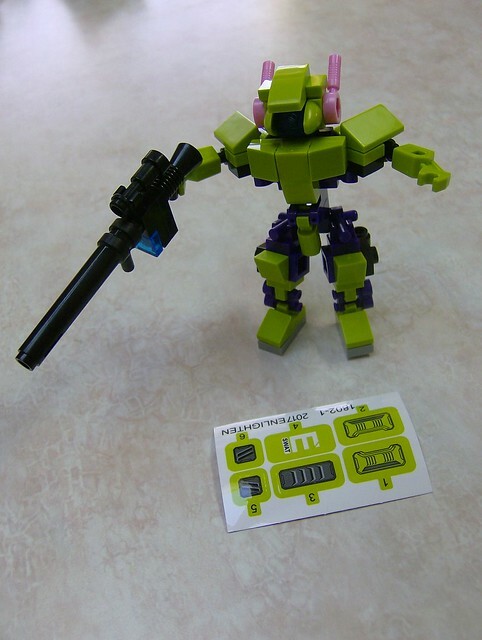 This is a very OBVIOUS bootleg of Pascal's MFZ Battletech Marauder. I guess we should be glad that there's a tiny bit of variation and they at least did it in a different color than Pascal's? 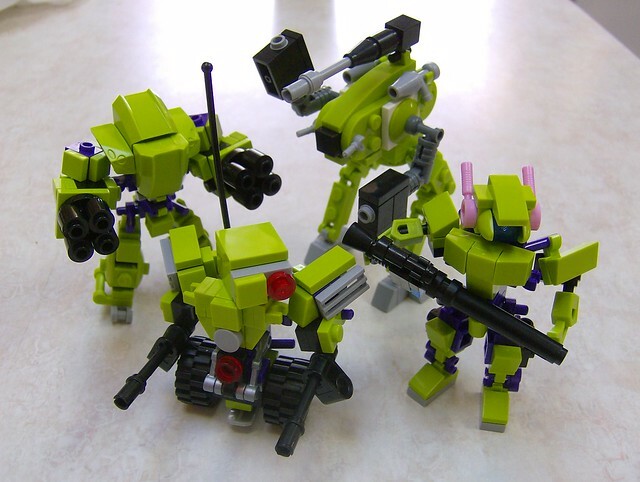 And, of course, all four of these guys can combine in typical BootLego fashion into a giant mecha, which is equal parts fiddly and unsuitable for Mobile Frame Zero, so it is not pictured. Here's a group-shot instead. Okay, with that out of the way, here's the breakdown. A total of 10 USD fetched us 269 pieces all total not counting the sticker sheets. That gives us a Price Per Piece of just under 4 cents; a tad higher than the past couple of sets I've reviewed, but still less than half of the standard LEGO PPP of 10 cents. The last time I had reviewed offerings from Enlighten, their production quality was bit hit or miss; depending on how new the set was, you could deal with any level of loose pieces, discoloration, and flashing that needed to be trimmed. Coming back to them years later, there is definite improvement, though Enlighten still leaves something to be desired in brick quality. While we've finally gotten out of the awkward flashing stage, the clips and pins are still a bit loose for my taste, and can cause issues for posing or holding together securely. As for my thoughts on these? Well, this is pretty tricky. 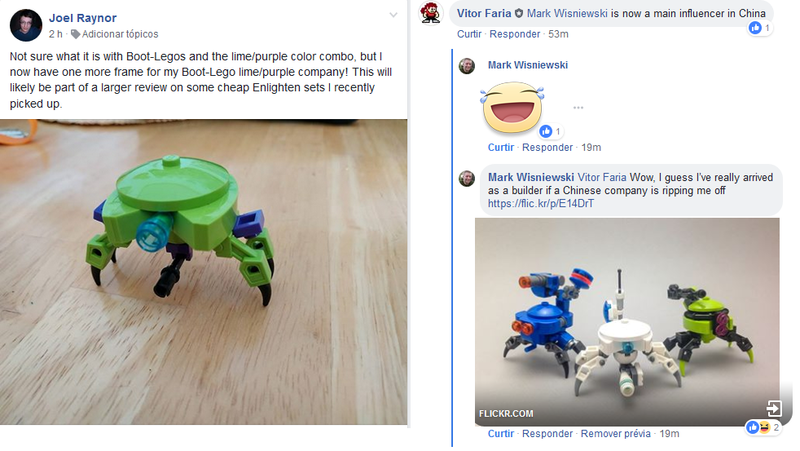 As I've come across in the past with MFZ designs being copied (shout out to you, Eduty), this whole business sits on a fine line between flattering, and stealing. So while I'm willing go into the breakdown of Price Per Piece and overall brick quality, I'll hold of on suggesting whether or not you, the reader, should pick these up. For that, I leave it to your discression and discussion in the comments below. Pretty sure this is the source of the third one's torso. I like the Purple and Lime color scheme. Had not realized there was a weird core piece in three of the four mechs. Still not sure how I feel about these designs and the way they borrowed from the community without asking. Mantisking wrote: Still not sure how I feel about these designs and the way they borrowed from the community without asking. Well they do say that "Imitation is the best form of flattery." I can definitely see Riptor25's point of view "this whole business sits on a fine line between flattery and stealing". Couldn't we, though, perhaps use this to the communities advantage? It's been a relevant topic of discussion with how to purchase premade models and sets for ex. here and here, to name a few. What if our community reached out to Enlighten and arranged a deal to franchise an official model line with them. Just a throwing out a thought. KungFujiApple wrote: What if our community reached out to Enlighten and arranged a deal to franchise an official model line with them. Thank you for reminding me that this thread exists. I'm honestly ashamed I'd forgotten, after the effort riptor went through to rally the troops. Are these still available? CmdrRook wrote: , after the effort riptor went through to rally the troops. Are these still available? Agreed. That is a really good question. Mr. Riptor25, Are these still available? Sorry, just got back from vacation to see this! Yeah, I still have a few left from the last effort. I don't know if I'll be getting any more after that, though. Community interest was...less than expected. So while I did manage to just about break even on the investment, it would take more than just a handful of buyers for me to do this again (Though I am very thankful for those of you who did buy some! I was really hoping it would take off). If you're interested, go ahead and PM me. I also fixed the images on the original post so you can get a fair look at the Firefly and Hellcat. The prices listed are still the same as well, barring availability. i sees lots of fake lego/megablok sets here but cannt find in stores. Where buy? As I understand it, eBay is the best place to find Boot-Legos but I've also seen various sets on Amazon. Ha! Didn't realize this was already under discussion! Battletech Marau is why I picked this set up. Steal at $10 imho even if it's flego. What IP is applied to MFZ builds? Are they Creative Commons? Public Domain? I haven't seen any obvious markings in the assorted files I've collected. KNEW I had seen these before (just couldn't find you!). Yeah the lime green is pretty...glaring. Maybe having your designs copied is a badge of honor? You've entered the BootLego Hall of Fame. SamSam wrote: i sees lots of fake lego/megablok sets here but cannt find in stores. Where buy? eBay is where I do most of my bootlego hunting. Key words like "building" "brick" "block" "deformation" "mech" "robot" and "space" are what I use to scrounge up stuff. starpause wrote: Ha! Didn't realize this was already under discussion! 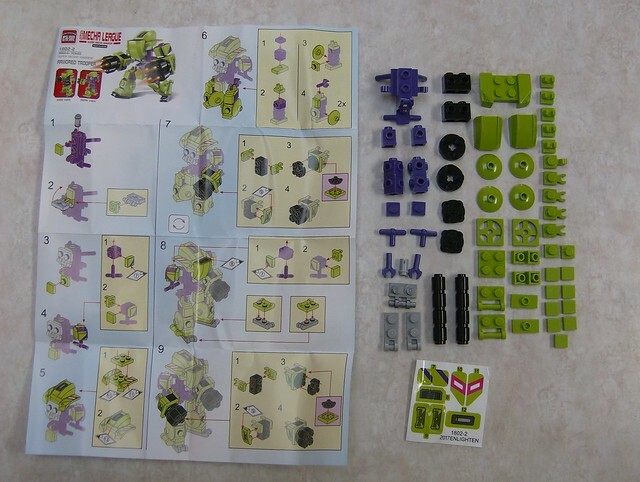 I worked really hard a few years back to try and get some kind of arrangement between a small Chinese distributor and some bootlego designs they had. It was a nominal success, but never really caught on. 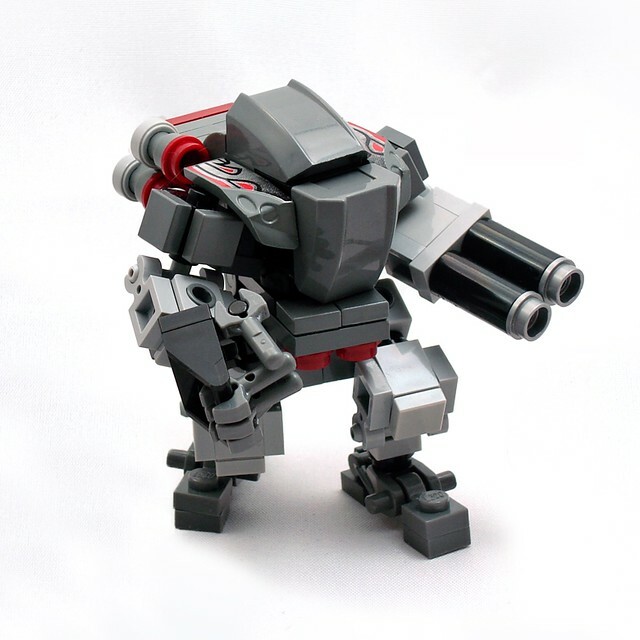 That Battletech Marauder was what originally brought up the discussion on licensing. Technically there's never been issues with IP, mostly because the designs were meant to be shared, but not mass produced and sold (cutting the original creator out of the loop). 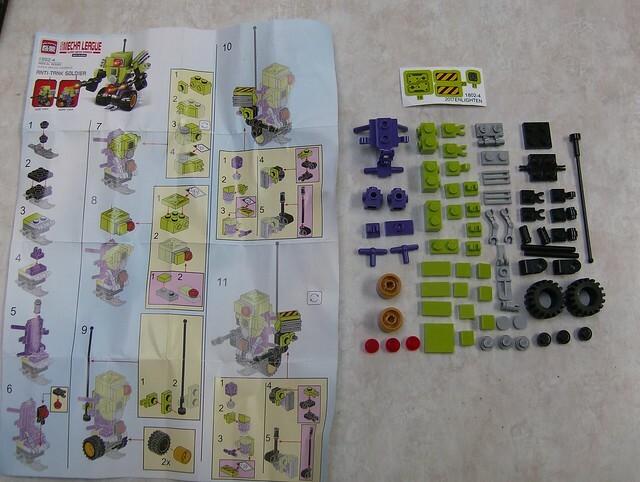 When these bootlego sets started cropping up, it questioned what exactly counted as MFZ licensing. As far as I could gather in talks with our friendly neighborhood mods and creator, the official MFZ sets (the Chub, HiLeg, etc) are part of the MFZ copyright. All fan-created ones are up to their individual creators. Hit me up if you're looking for any ones I've reviewed before. I'll see if I can still find them floating around the internet. Mark is now on the Hall of Fame as well! VitorFaria wrote: Mark is now on the Hall of Fame as well! I should take a picture of all of them together. They make quite a nice company, and all color coordinated on top of it!